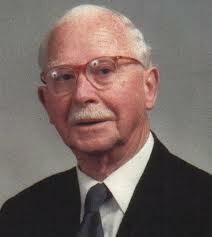 An innovator in eye surgery and the inventor of the intraocular lens (IOL). Nicholas Harold Lloyd Ridley was born on July 10 1906 at Kibworth Harcourt, Leicestershire, England. Due to age, trauma, toxic chemicals or certain diseases such as rubella or diabetes, the proteins that make up the lens become opaque which prevents light from entering the eye and causes cataracts. The ancient Greeks used to deal with this condition by crudely pushing aside the lens within the eye. And until Ridleys invention there was nothing better other than removing the lens and wearing heavy spectacles. Attempts made in the 19th century to replace the lens within the eye with a glass lens failed disastrously. As glass, which is very inert, caused reactions it was decided that such an operation was impossible, and that an artificial lens would be rejected by the body's immune system. During WWII Gordon Cleaver, a young Battle of Britain pilot, had negleted to wear his eye protection. Gun fire shattered his cockpit canopy, and splinters of perspex had destroyed one eye and severely damaged the other. Ridley was a member of the surgical team treating young pilots at Moorfields, and noticed the fact that, although the patient's better eye was peppered with fragments of perspex, there was no foreign-body reaction to it. Though lodged in the eyeball, these splinters were apparently inert, and caused no adverse reactions in the sensitive tissues of the eye. Ridley began to work with John Pike, an optical scientist from Rayner, a lens company, in Hove, Sussex. He learned from Pike that ICI could produce a lens suitable for his purposes, and for less than £1 each. The two men agreed there and then that they would never seek to profit from this invention, a mark of real medical professionals, service not self. 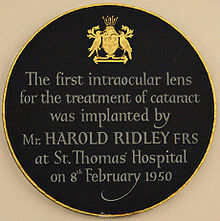 From 1946, Ridley was a consultant surgeon at St Thomas's, and on February 8th 1950, he became the first person to successfully implant an artificial lens. The operation was televised, another first, so that other ophthalmologists in the hospital could watch. In 1951, Harold Ridley announced the operation to an ophthalmological congress at Oxford. The news provoked intense opposition, especially from Sir Stewart Duke-Elder, who was surgeon-oculist to the Queen. As early as 1952 he would fly to New York or Washington at weekends, operate there, and return to his London practice by Monday morning. While Americans welcomed a new idea with such enthusiasm, it was so typical that the companies who made the lenses in the USA did not share Ridley's relaxed attitude to profits. Unlike Rayner, they set their prices as high as possible. 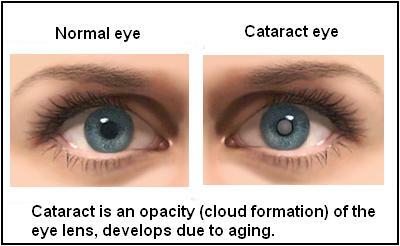 Intraocular lens implant is now the most commonly performed eye surgical procedure. 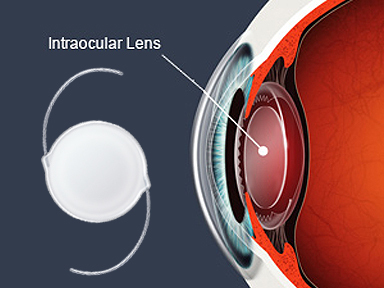 More than 6 million lenses are implanted every year. Ridley gave this to the world for free. Ridley continued in private practice in Harley Street until he was 85. He was elected a Fellow of the Royal Society in 1986, and knighted in 2000. Among the many medical honours he received were the Gullstrand Medal of the Swedish Medical Society, and the Gonin Medal from the International Council of Ophthalmologists. At the end of the 1980s he himself had the lenses in both his eyes replaced. "I am the only man to have invented his own operation," he reflected.